09/05/2013 - TORRANCE, Calif. The new 2014 Acura TL is now on sale, with a manufacturer's suggested retail price (MSRP) starting at $36,0301. As Acura's award-winning, performance-oriented sport sedan, the TL balances style, luxury and dynamic performance in a unique way. This dynamic and spirited performance is balanced with an EPA fuel economy rating of 29-mpg highway (TL)2. As the 2013 TL was one of the industry's first vehicles to earn a TOP SAFETY PICK+ from the Insurance Institute for Highway Safety (IIHS), including a GOOD rating in the Institute's new small overlap front crash test, the TL's safety credentials are well established. The entire TL model line carries over for 2014 and is comprised of eight variants, starting with the front-wheel drive 3.5-liter TL. Three upgrade packages are available on the TL - the Technology, Advance and Special Edition packages. The two-wheel-drive TL Special Edition features distinctive 10-spoke, 18-inch alloy wheels, a color-matched decklid spoiler and Special Edition badging. The TL SH-AWD® features Super Handling All-Wheel Drive™ and a 3.7-liter engine and is likewise available with either the Technology or Advance Package. All models feature a Sequential SportShift 6-speed automatic transmission, while the TL SH-AWD® with Technology Package is also available with a close-ratio 6-speed manual transmission as a no-cost option. 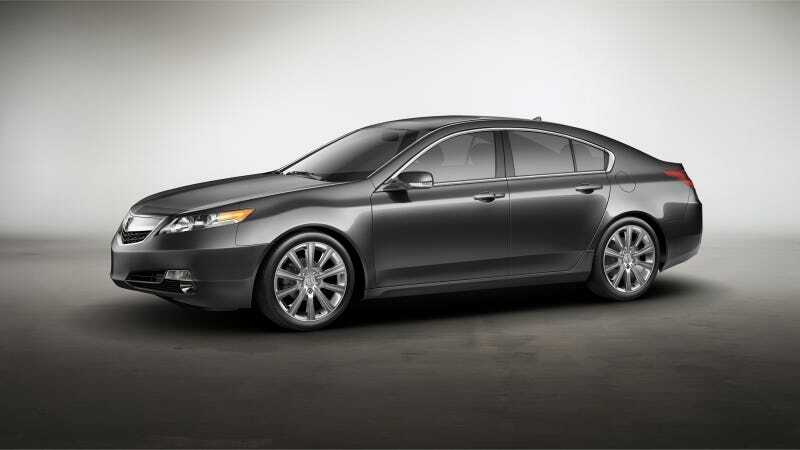 View, build and price a 2014 Acura TL at http://www.acura.com/ModelLanding.aspx?model=TL. With its aggressive wheel arches, dramatic character lines and Acura signature grille, the TL has a powerful and distinctive presence. All TL models feature premium details such as stainless-steel body trim, a power moonroof, Xenon High Intensity Discharge (HID) headlights and LED taillights as standard equipment. The TL cockpit features a "dual personal" design that provides both the driver and front passenger with their own personal space, and sets a "driver's car" theme. The TL offers a remarkable range of standard features, including a 10-way power driver seat (8-way power adjustment with 2-way lumbar support) and 8-way power passenger seat, steering-wheel mounted paddle shifters (for models equipped with the Sequential SportShift 6-speed automatic transmission), and an 8-speaker, 276-watt audio system with 6-disc CD changer, AM/FM radio, XM® Radio, Bluetooth® Audio, USB port connectivity, and HandsFreeLink® wireless telephone interface. The Technology Package includes a Keyless Access System (also standard on the TL Special Edition) and luxurious full-grain perforated premium Milano leather seating surfaces. The package also includes an Acura Navigation System with Voice Recognition™, rearview camera, available AcuraLink Real-Time Traffic with Traffic Rerouting™ and AcuraLink Real-Time Weather™. For the ultimate audio experience, the Technology Package includes an Acura/ELS Surround®3 10-speaker, 440-watt premium audio system with XM® Radio and a 3,500-song hard disk drive (HDD) media storage system. The available Advance Package includes everything in the Technology Package and adds heated and ventilated front seats and a blind spot information (BSI) system that alerts the driver to vehicles detected in vehicle's the blind spot areas. The TL offers a choice of two all-aluminum powertrains. The standard 3.5-liter V-6 produces 280 horsepower and 254 lb-ft of torque4 and drives the front wheels through a sophisticated Sequential SportShift 6-speed automatic transmission with steering wheel-mounted paddle shifters and Grade Logic Control System. The TL SH-AWD® (Super Handling All-Wheel Drive™) is powered by a 3.7-liter V-6 engine producing 305 horsepower and 273 lb-ft of torque5. The innovative, torque-vectoring SH-AWD® system, in addition to providing outstanding all-weather traction and cornering grip, can send more torque to the outside rear wheel when cornering, to create a "yaw moment" that enhances vehicle dynamics by generating a turn-in effect. Like all Acura models, the TL features the Advanced Compatibility Engineering™ (ACE™) body structure, which enhances occupant protection and crash compatibility in frontal crashes. Additional standard safety equipment includes Vehicle Stability Assist™ (VSA®) with traction control, ABS, dual-stage/multiple-threshold front airbags, front-side airbags, side curtain airbags for all outboard seating positions, front seatbelts with automatic tensioning system and load limiters, Tire Pressure Monitoring System (TPMS) and Daytime Running Lights (DRL). The 2013 TL earned the top-level rating of TOP SAFETY PICK+ from the Insurance Institute for Highway Safety (IIHS), including a GOOD rating in the new IIHS small overlap front crash test. This test is designed to simulate a collision between a vehicle traveling 40 miles per hour and a fixed object, such as a utility pole, where only 25-percent of the vehicle's front structure engages the opposing object. According to a study by the IIHS, small overlap crashes of this type accounted for nearly 25-percent of frontal crashes resulting in a serious injury or fatality. The 2014 TL is produced by Honda of America Mfg., Inc., in Marysville, Ohio6. Like every new Acura, the 2014 TL is covered by a comprehensive 4-year/50,000 mile new vehicle limited warranty and a 6-year/70,000 miles powertrain limited warranty. Additional benefits of ownership include Acura Total Luxury Care® (TLC®), which provides free 24-hour roadside assistance, concierge service and trip routing.